Powell Electronics is fully committed to meet the rapidly developing electrical needs of the agricultural industry. We offer a full ISO 11783 interconnect system as well as a line card that boasts the leading manufacturers of commercial agricultural electrical components. The result is flexible supply chain solution specific to the agricultural market. The ISO 11783 standard is based on a Controller Area Network (CAN) protocol, which is used to control some of the components in agricultural equipment for many years. ISO 11783 defines a standard format for messages travelling between electronic devices. Complying with ISO 11783 ensures the connectors and wiring harnesses are compatible and their electronic systems can communicate with each other. Want to experience the quality and durability of our new Powell Agriculture products? Click on the button below to request a FREE Powell Agriculture Sample Kit. Our kit will include a sample of our ISO BUS Implement Connector (IBIC) as well as a cap for the connector. In an effort to standardize communication of electronics in mechanized equipment ISO 11783 (ISOBUS) was developed. 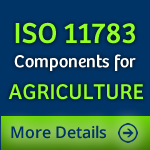 The ISO 11783 standard is based on a Controller Area Network (CAN) protocol, which has been used to control some of the components in agricultural equipment for many years. Complying with ISO 11783 ensures the connectors and wiring harnesses are compatible, and their electronic systems can communicate with each other. The physical bus used is compatible with the SAE J1939-11 standard. This is a passive two-wire bus terminated at the bus ends by a characteristic impedance. The entire ISOBUS is divided into at least two segments. The tractor bus is a segment which permits communication within the tractor: engine, powertrain, hitch valves, etc.. The second segment is the implement bus which is available for communication between implement and tractor as well as between implements themselves. At least one Tractor Engine Control Unit (ECU) serves as the interface between the two segments. The Implement BUS Breakaway Connector (IBBC) from Powell Electronics is a cost effective connector for CAN based implement systems. The IBBC is a connector interface that is standardized after ISO 11783-2, connecting tractor and implement. The standardization makes it possible to connect and power all implements and systems that require ISO BUS communication. The necessary electronics to enable communication on a highly intelligent level, as described and standardized in ISO 11783, are fully integrated. The IBBC maintains full compatibility with ISO 11783-2 standard insuring the implement communication with tractor or construction vehicle. The implement harness connector is easier to line up and push into place. Because the handle is of powder coated aluminium, it will not corrode due to exposure to farm and other chemical substances. The handle holds the connector firmly in place, but the latch/release allows the connector to break away in case of mishaps. This breakaway function will successfully perform more times than any product on the market. The Powell Electronics ISO BUS Implement Connector (IBIC) is a new design of the implement connector specified in the ISO 11783 protocol for the electrical connection of implements to the tractor or other agricultural vehicles in order to transfer power signals and CAN Bus communication to and from the tractor and implement. This IBIC is a long required new development for the implement manufacturers that rely on high quality and cost effective solutions. The ISO BUS Implement Connector combines the use of highly reliable non-corrosive materials with a unique design guaranteeing a long life span in highly aggressive environments of highly demanding performance. The IBIC is designed to mate with the Powell ISO Bus Breakaway Connector (IBBC) but is also backwards compatible with previous designs in the market. The ISO Box Rear Connector (IBRC) is a cost effective connector to mate with the Powell IBBC breakaway connector. The IBRC maintains full compatibility with ISO 11783-2 standard insuring the implement communication with tractor or construction vehicle. The IBRC connects the cabin wire harness to the IBBC with the ease of precision. The component requires no tool for population, making it an innovative solution to complex tooling issues. After mating, sealed after IP67. The harness manufacturer can order the IBRC separately of the IBBC. The connector's innovative design allows it to be ordered with contacts as part number IBRC or without contacts as part number IBRC(LC). The Terminating Bias Circuit (TBC) from Powell Electronics is a cost effective way to provide active or passive termination for CAN Bus vehicle networks. The TBC Terminator maintains full compatibility with the ISO 11783-2 and SAE J1939 standards. In some systems used today, termination of CAN-based systems is made inside a controller on an assembled printed circuit board (PCB). The Powell Termination Bias Circuit is an inexpensive, separate unit that provides the electrical bias and termination at each end of a CAN Bus segment needed to suppress reflections on the CAN Bus. The Powell TBC is compatible with the ISO 11783-2 and SAE J1939 standards.The printed circuit board is moulded into polypropylene that protects the electronics from harsh environments. In addition to its full line of AT contacts available to the agricultural industry, Powell Electronics is proud to introduce a 9-pin Diagnostic Jam Nut Receptacle after SAE J 1939 and ISO 11783-2 standards, featuring AT contact technology. The new 9-pin connector is part of a series designed to perform in the demanding environment found on construction and farm equipment as well as a truck environment. The AT Circular series is a moulded thermoplastic receptacle with a positive retention system and sealed by redundant grommet wire sealing. The jam nut design ensures the required easy handling on the assembly line. The AT contact technology is already used successfully at major OEMs and features machined and stamped and formed versions.